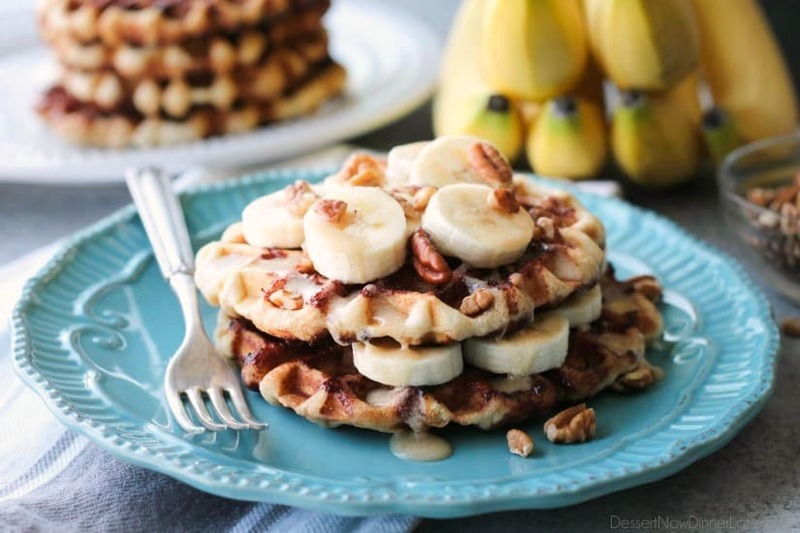 Banana Nut Cinnamon Roll Waffles - Dessert Now, Dinner Later! 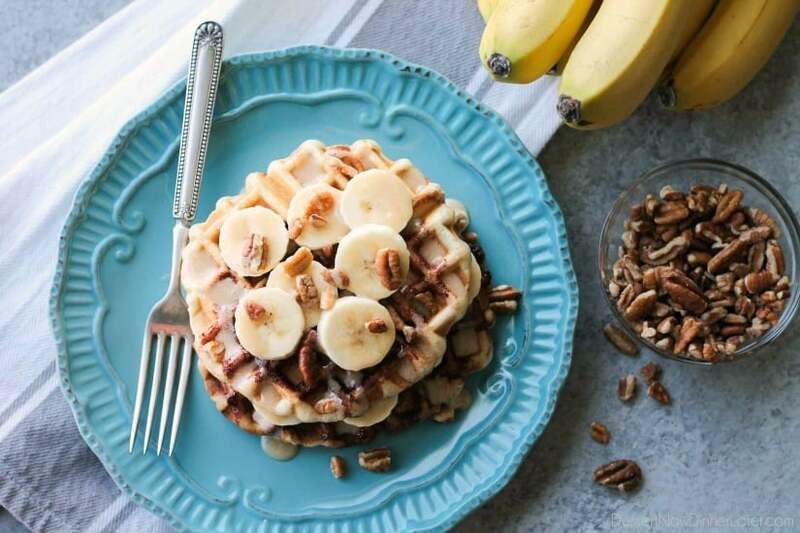 Cinnamon Roll Waffles are topped with freshly sliced bananas, crunchy nuts, and a maple cream cheese drizzle. Mother’s Day is coming up and these cinnamon roll waffles are easy enough for the kids to make with Dad — for Mom — on her special day! I’ll be honest. I’m an early bird, so I probably won’t get breakfast in bed for Mother’s Day, but I’m still totally okay eating this at the table with the hubs and our kids. I wake up early because it’s the only time I have to be alone and think before the craziness of the day begins. I love this solitude time for myself. I wake up and listen to spiritual messages and/or scriptures while I get ready. Then I workout to get those endorphins going (and so I don’t feel as gross when I eat my weight in the sweets that I make for this blog). After that, I freshen up and rotate helping my kids get dressed, fed, and ready for the day, whether they go to school or stay home. We do this even in the summer, because I like checklists and accomplishing things. I feel like I get more done in the day when I start early, and I hope it teaches my kids responsibility too. My feelings of motherhood fit somewhere between pure joy and feeling like I live in an insane asylum. I have 3 wonderful children who are bright and creative and fun, but my brain is constantly going. I feel like there are three mini versions of myself running in circles in my brain trying to figure out which way to go. Which makes it really hard to focus and formulate sentences. Haha. So if none of my blog posts make sense, that’s why! Anyway, back to Mother’s Day. 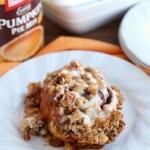 I love cinnamon rolls, and instead of having my husband just bake off some Rhodes Cinnamon Rolls, because they are just as good as homemade and my husband won’t even go there — I thought it would be fun to press the cinnamon rolls in a waffle iron, top them with some yummy toppings (bananas and pecans) and drizzle them with a mixture of maple syrup and cream cheese frosting. 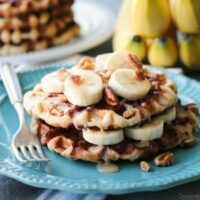 A little decadence is good for special days, and these Banana Nut Cinnamon Roll Waffles are tasty and fun! Enjoy my friends! 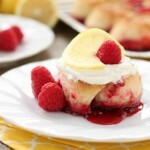 In a large bowl, whisk the maple syrup together with the thawed cream cheese frosting packet and set aside. 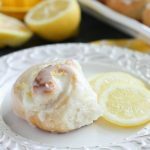 Place a thawed cinnamon roll between two pieces of wax paper or tin foil and roll/flatten with a rolling pin into a 4-5 inch circle. Carefully transfer the flattened cinnamon roll to a waffle iron that's been sprayed lightly with cooking spray and heated to medium-low heat. Hold the top of the waffle iron down slightly so it does not rise up when the roll plumps. Cook for about 1-2 minutes or until golden brown (waffle irons vary). Remove the waffle from the iron with a fork and place on a plate. Repeat with remaining cinnamon rolls, spraying the waffle iron with cooking spray before cooking each waffle. NOTE: Be careful not to touch the hot cinnamon filling from the waffle. Things do get messy. Clean the waffle iron as soon as possible after finishing. 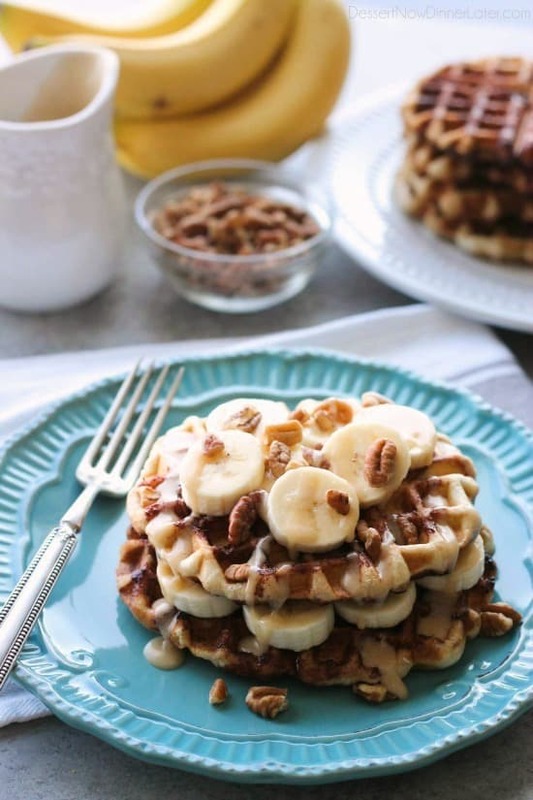 Top with slices of banana, chopped pecans, and a drizzle of the maple cream cheese mixture. Enjoy! 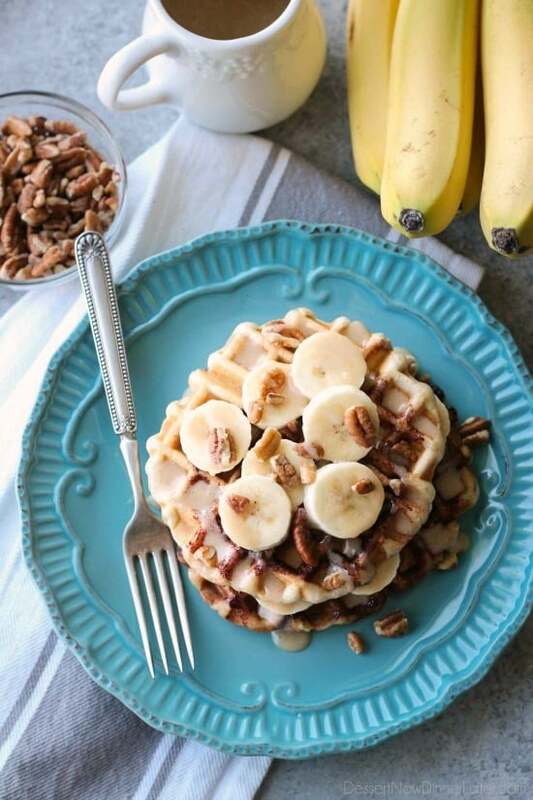 Bananas, cinnamon rolls and pecans. Sign me up!